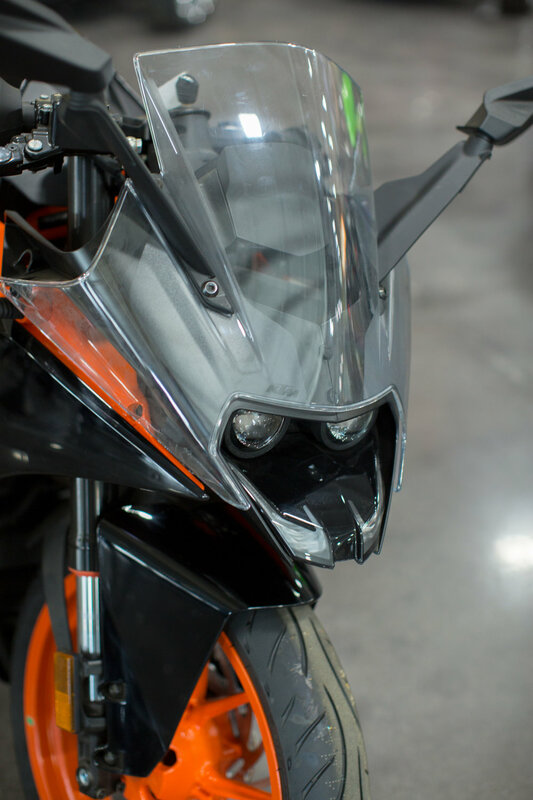 The KTM RC 390 is a race bike at its core. 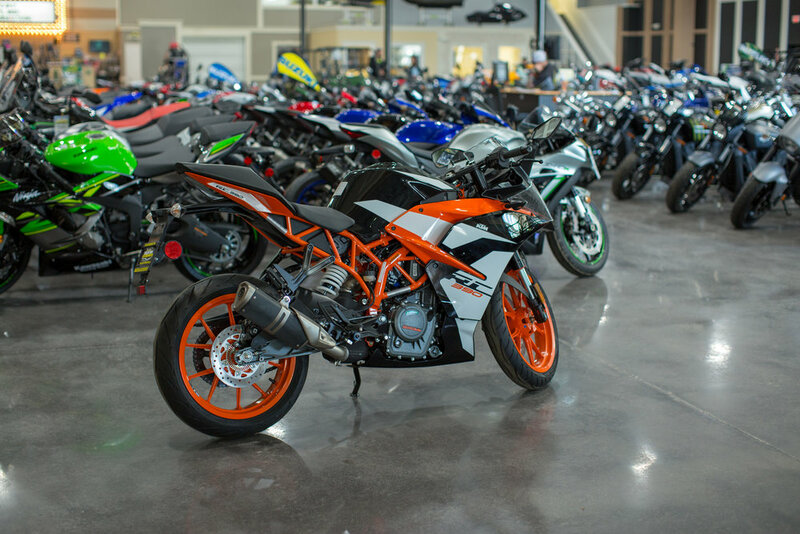 If you are looking for a “beginner” bike and you also might want to do a track day, there is no other bike you should be looking at. This thing is basically a super sport bike packaged with a single cylinder 373 cc engine. While 43hp and 26 ft lbs of torque doesn't seem like much, it still boasts a top speed of 104 mph and posted a 14.02 second quarter mile. 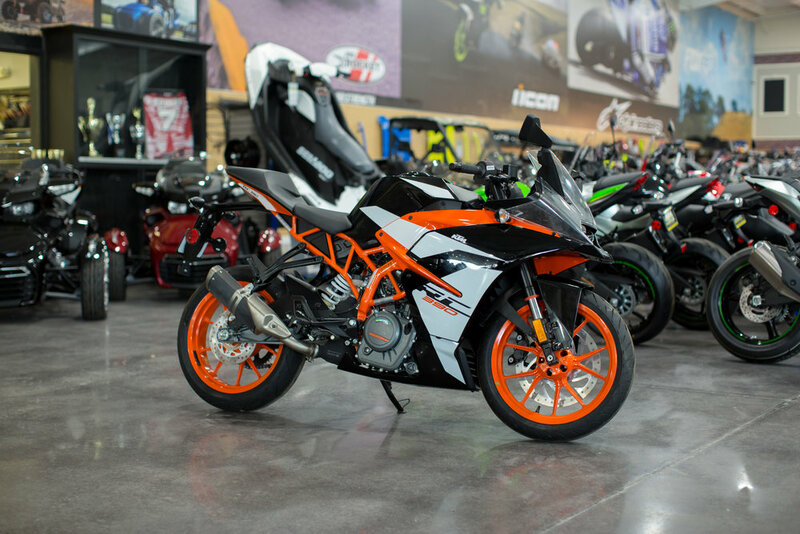 Compared to other lower cc bikes, the seating position is very aggressive. 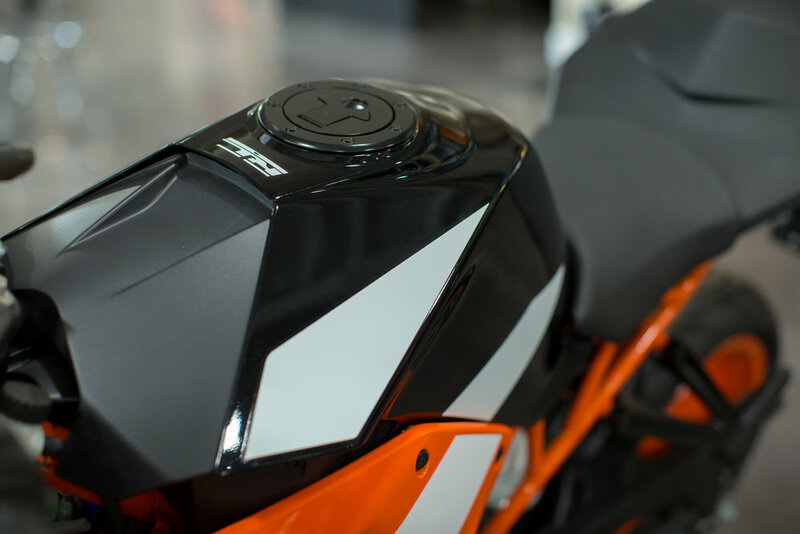 The ride by wire throttle delivers torque in a smooth yet snappy manner. ABS does come as a standard, but can be toggled off to be "ready to race". A slipper clutch is also equipped on this bike and eliminates rear wheel chatter when downshifting too rapidly. The bike feels aerodynamic and stable even at highway speeds. Most smaller bikes can feel turbulent when dealing with high speed winds. 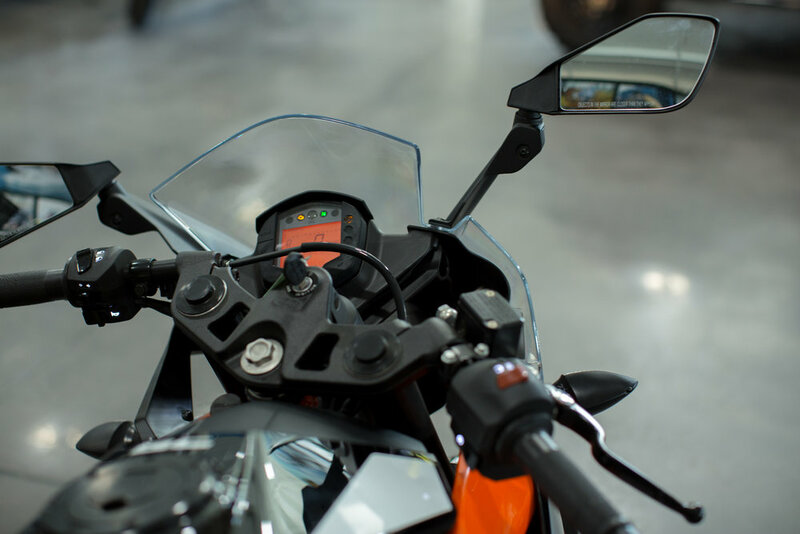 The RC390's windscreen and riding position makes highway rides very comfortable. Around town the low end torque is what makes this bike an absolute joy to ride. In curves, this bike is the perfect balance between very flickable, and yet stable. Coming in with a wet weight of 340 pounds, it can easily be thrown back and forth quickly while still maintaining a planted feel. I’d recommend this bike for the person who wants a sportier beginner bike experience. Or someone who likes technical routes around town, and runs the mountain roads aggressively on the weekends. Truly, the greatest part about this bike is that it has so much to offer, even for an experienced rider. 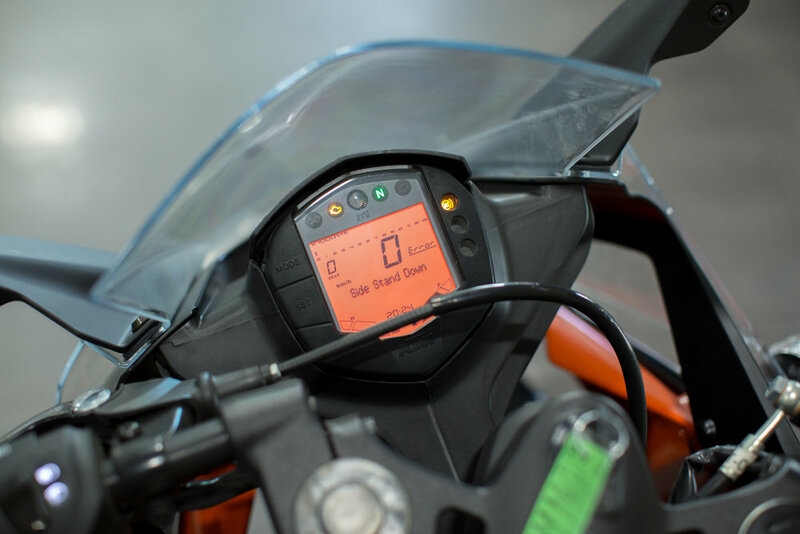 It is a motorcycle that can be fully utilized on the street, unlike most 600cc and up bikes which will never even come close to using 50% of their potential on the street. You can push this bike to use all of its potential and have a damn fun time doing it. It’s not the fastest bike out there by a long shot, which forces you to be a better rider. To ride that perfect line, to have that precise corner entry speed, and to know exactly when to get back onto the throttle as soon as possible. It’s a bike that demands that you hone your riding techniques. Yes, it’s a “beginner bike,” but definitely has room for a higher skill ceiling than other starter bikes. Riding the RC390 was a blast and it’s officially become my favorite beginner bike.